The UIC Health Sciences Campus-Rockford is home to programs of the University of Illinois at Chicago’s Colleges of Medicine, Nursing and Pharmacy. The UIC Health Sciences Campus-Rockford at 1601 Parkview Ave. in Rockford, Ill., is nestled in a 20-acre, park-like setting in a neighborhood just east of the Rock River. 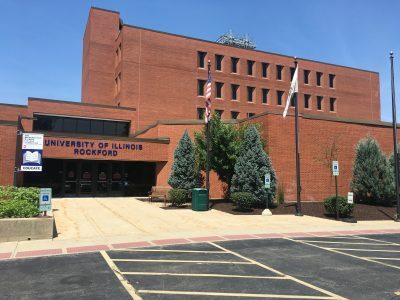 The UIC Health Sciences Campus-Rockford is home to the University of Illinois College of Medicine Rockford, the University of Illinois at Chicago College of Nursing-Rockford Regional Campus, and the University of Illinois College of Pharmacy at Rockford and their respective programs, centers and research. The Crawford Library of the Health Sciences-Rockford on the campus serves students, resident physicians, staff and faculty and is open to the public. Other groups and organizations may also rent space on the campus. The Medical Student Activity Center, also known as The Green House, is a place for students to meet, relax and study. The campus has five buildings that are connected – the North Building, South Building, East Building, Maintenance Building and the A Building – plus a Medical Student Activity Center. The main entrance and reception area are located on the east side at the newest A Building. The campus itself dates back to 1916 when it became home to the Rockford Municipal Tuberculosis Sanitarium (North Building). The sanitarium expanded in 1945 through the addition of the Art-Deco-style South Building. As better treatments for the respiratory illness were developed, the need for a TB sanitarium waned. The founders of the College of Medicine Rockford determined that the Parkview Ave. campus was a good site for a new community-based medical school and it was purchased by the University of Illinois at Chicago in 1971 and, in 1972, the first medical students came to campus after spending their first year at the Urbana campus. The second oldest building on campus, dating back to 1927, is the cottage near the North Building that is the Medical Student Activity Center, known to many as the “Green House,” where medical students since the first class have used the space for studying, events and recreational activities. The East Building is six floors tall. The six-story East Building was added in 1974, providing laboratory space for research, offices and classroom space. In 2017, this building underwent extensive remodeling to accommodate a Gross Anatomy Laboratory, Team-Based Learning Classroom, Virtual Anatomy Laboratory and enhancements to the Commons. The Art Deco-style South Building was once part of the Rockford Municipal TB Sanitarium. Today it houses administrative and faculty offices. The South Building is home to the College of Nursing, which came to the campus in 1991 offering a Master of Science in Nursing and Doctor of Nursing Practice programs and is located on the third floor. The South Building is also home to the College of Medicine’s Office of the Dean, Office of Human Resources, Office of Financial Affairs, the Central Dining Room and other offices and conference rooms. The North Building’s red awning welcomes patients to Student Health and Wellness and the UI Health Thyroid Disease in Pregnancy Clinic. The North Building is home to the UI Health Thyroid Disease in Pregnancy Clinic and Student Health and Wellness, which are both accessed through the entrance with the red awning. The Office of Research and several faculty offices are also in the North Building. College of Pharmacy faculty offices, a research lab and student lounge are also in the North Building. The main entrance to the campus is in the newest A Building. In 2009, a 58,000-square-foot, Silver Leadership in Energy and Environmental Design (LEED) Certified addition was added to the campus. The A Building provides space for the College of Pharmacy program that started enrolling students in 2010, as well as the College of Medicine’s National Center for Rural Health Professions, Office of Student Affairs, Office of Medical Education, lecture halls, study rooms and event spaces. In addition to the Crawford Library of the Health Sciences, this three-story addition also houses the Glenn Netto Health and Wellness Center, Simulation Center, Clinical Skills Center and Computer-Based Testing Center. For information, call (815) 395-0600.